Got this one as a review copy from NetGalley, and it’s a bit better than the last one (Crucible). It’s about, as you might guess, Obi-Wan Kenobi, as he tries to watch over the infant Luke. It’s framed by Obi-Wan’s attempts to recreate the meditation Yoda showed him in order to speak to Qui-Gon. The rest of the story plays out much like a western, with the Sandpeople taking the role of the (possibly not so) evil Indians, the black-hatted head of the local militia/neighborhood watch/cattle baron trying to wipe them out, and the simple, honest townsfolk caught in the middle. 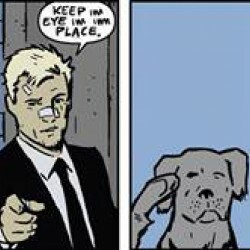 There’s even a potential love interest for our Jedi Master taking the Miss Kitty spot, though not in a space bordello. That woman is the real driving force of the story – Annileen runs the general store/saloon in these parts, having taken it over when her husband passed. Both she and her daughter take a shine to the mysterious stranger, moreso when he time and again steps in to try and smooth over an argument or defuse a dangerous situation. 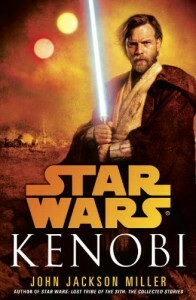 The resolution of the main plot gets a little jumbly and scattered, but the story is worth reading if you like Obi-Wan, and want to learn about what he did to keep busy after setting up shop to watch Luke. John Jackson Miller does a solid job making the idea of people living on Tatooine make sense. The book is out today, if it sounds like something you’d enjoy. It’s one of the better SW EU books I’ve read recently.